In most fields of knowledge and practice, for example medicine, there is an agreed-upon body of knowledge, skills to be mastered and practices to be drawn from. This does not exist in the field of community-based peacebuilding. Peacebuilders don’t always know where to look for what they need, or they may be overwhelmed by the sheer amount of information. 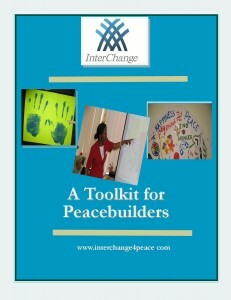 InterChange members developed the idea of a Toolkit for Peacebuilders which would allow InterChange members to share peacebuilding models, tools and ideas they have found useful. The intention is not to create an exhaustive list of resources, but rather to build our network of peacebuilders by sharing things we have personally found useful. be an online resource with a searchable function so you can easily find what you’re looking for, and there’ll also be a format for you to be able to easily print off the sections you’d like. Fill in and send back the Toolkit Form with your description of resources you have found useful and think that others would as well. They may be things you and/or your group have developed or they may be resources from elsewhere, but the key issue is that you have personally used the resources and found them useful. You’ll be listed as the contact for the resource, and we see the project as being very helpful in building the InterChange network. that’s fine! If you can’t decide what the category is, don’t worry—we’ll figure it out. If you have more than one resource to contribute, please use a separate form for each one. please keep your description brief. We’d like to have short, succinct listings about each resource, with information about how people can find out more. Please include information on how people can contact you, and if possible, send us an illustration or photo of the resource or how you are using it. submissions will be edited for length and clarity, if necessary, and the committee might get back to you with questions. The committee is also working on designing the Toolkit and developing the logistics of the members-only website. incentive. Everyone who has a resource accepted for the Toolkit will be offered free membership to InterChange for the year. submissions to the Toolkit. We can be reached at community@interchange4peace.org.